High production (2,5 mt/min – 2,7 yd/min) rotary printer machine for transfer printing in sublimation knitted, synthetic fabrics, and non-cloth fabric such as polyester, nylon, acrylic. 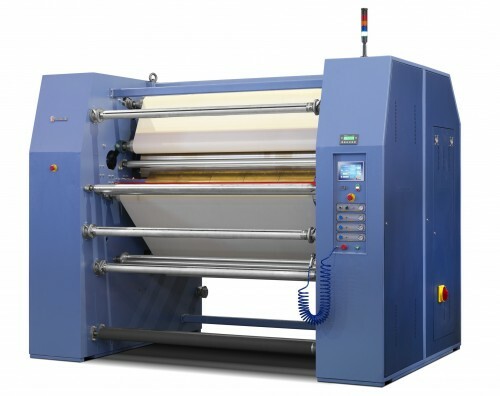 The three air shafts enable the operator to take and position the transfer paper, the material to be printed and, where necessary, the protective paper. Using gravity to load the machine in a straight and even manner, the transfer paper is positioned directly over the entrance to the print rollers; the tension can be regulated by means of a pneumatic clutch control; the material is made taut and goes through an “s” which makes the product even tauter; the material moves over an expandable roller which ensures a straight trajectory towards the entrance of the press. An important characteristic is that the paper and the fabric are immediately separated after the printing phase and transported to the back of the machine where easy access to their respective winders is ensured. The pneumatic reel holder rods and strengthening supports have been designed to allow the operator to remove the empty reels and reposition the said rods in a single gesture. The pneumatic clutch and electronic speed control allow simple adjustment of the rewinding tension.